3D monitoring using manual or robotic total stations and reflective targets is a useful and practical method to determine whether structures are undergoing any deformation as a result of external influences. This method normally consists of the sighting of strategically placed reflective targets or prisms on the monitored structure. It is a cost effective system well suited to monitor buildings, walls, retained facades, capping beams, and any structure undergoing stress to millimetre accuracy. Measurements can be taken manually or automatically, depending on the required frequency, accessibility and accuracy. Results from this technique provide three-dimensional deformation of the structure and allow for post survey analysis to quantify the degree of deformation using such techniques as Boscardin and Cording analysis and time/value trend patterns. Precise levelling is a fast, very cost effective and highly accurate method for detecting even the smallest changes in elevation associated with any site activity. Precise levelling techniques have also been used in testing environments, particularly where the effect of stress on a structure needs to be determined. Strategically placed precise level points can correctly and precisely determine the extent of heave or settlement on any structure. The large amount of soil extraction that occurs during the excavation phase of any construction project can result in ground movement, which can affect the surrounding structures to varying degrees of severity. The most pronounced measure of movement caused by the excavation is normally found in the walls of the excavation area. Inclinometers in the piled walls, combined with the survey points on the capping beam can determine whether the piled wall is undergoing deflection along its full length. An inclinometer is a geotechnical instrument for measuring lateral movements. During the survey the probe is drawn upwards from the bottom of the tube, halted at half metre intervals and the tilt of the probe is recorded. A deflection plot is generated from the data, which accurately indicates the magnitude of deflection at specific depths along the length of the inclinometer tube. This process can be automated where instantaneous knowledge of the deflection is critical. Instruments can be permanently installed within the piles, creating an in-place inclinometer system. A new innovation in monitoring contiguous piled walls is fibre optics. SES is constantly looking for new innovations which benefit our clients directly. One of these developments is to pass a fibre optic cable through the pile to measure strain at pre-determined intervals along its full length. This cuts initial installation costs and data collection speed. This system also allows for structures to be monitored well into the life of the building, adding significantly to post construction analysis of a building and its design predictions. Through the use of tiltmeters and electrolevel beams, various structures, such as building facades and piled walls, can be monitored remotely and in real-time. This carries all the benefits associated with avoiding on-going access to the location during the monitoring period due to dangerous phases of demolition or construction, and can be particularly helpful during restricted access. It also allows for real-time, continuous monitoring over any period of time, and can provide an excellent warning system for possible deformation. Systems such as this have been used to good effect on listed buildings to monitor the real-time effect of jet-grouting beneath the building. This method is used to monitor settlement and heave at varying depths in excavations, foundations, dams and embankments. It can also be installed behind retaining structures, such as sheet piles, retaining walls and slurry walls. Data from the extensometer indicates the depths at which settlement has occurred as well as the total amount of settlement. Laser scanning offers the benefit of surveying structures using a very dense point cloud. These point clouds create a detailed 3-dimensional view of the structure. A laser scan of a structure at different time intervals (normally before and after any external influence is applied) will create a unique comparison. By simply overlaying (or subtracting) one point cloud from another will immediately highlight the changes in the structure visually by creating "hot-spots". Although this tool will not be able to offer any real-time analysis, it does offer a very detailed insight into the overall movement of a structure over time, and as such is a useful analysis tool in comparing predicted movement to actual movement. Cracks occur in most buildings and civil engineering structures. Monitoring the changes in crack width is an important diagnostic technique for determining the cause and specifying the remedial work. A series of Demec studs can be established adjacent to each crack which can be used to measure both widening and sheering to a high degree of accuracy. This type of system allows for accurate real-time measurement of the structure of vertical movement, be it either settlement or heave. Typical Applications include monitoring of tunnels, excavations and grouting zones. This system is especially adapted to an environment where conventional survey techniques would be cumbersome, or not possible. Structures that are located in surroundings which contain a high risk to the personal safety of individuals (such as confined spaces, risk of collapse, hazardous gases, etc.) would benefit from this type of system. Additionally, a building that is considered structurally sensitive to vertical movement would benefit in obtaining real-time data from this system. An alarm can be activated immediately if a pre-set trigger limit is reached, allowing for remedial action to be implemented before serious damage can result. 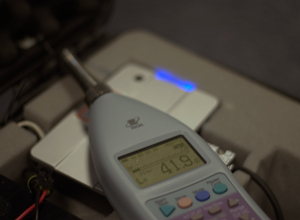 Sound and Vibration levels are often required to be measured during demolition and construction activity, particularly when the project lies in close proximity to adjoining occupied buildings. SES is able to provide this service utilising industry specific equipment. SES is experienced in designing and adapting the system to the client's requirements, from remote logging, data processing and reporting, to on-site training for client-side data examination. If the alarm module is included, and a pre-determined trigger limit is reached, a web-based alarm (or on-screen pop-up) will become active. This is relevant for both the sound and vibration monitoring units. 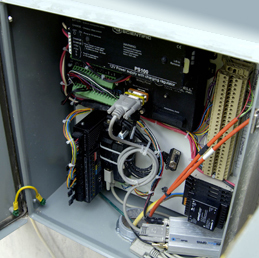 These systems, once installed, will not need to be accessed, other than routine maintenance.